You will receive an email with all the "paths" in PDF format (so to red the description),in KML format (to check the paths on Google Earth) and GPX format (so to use it with yourn navigator). 3) Receive via email all the paths we have prepared for you! 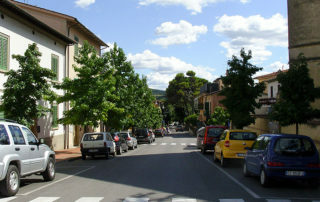 Start from Montaione (Piazza Gramsci) and go up in the direction of the center. After a few meters, at the stop sign, turn left onto Viale Filicaja starting a slight descent. After about 700 meters to the end of the descent pass next to the junction for San Vivaldo – that you see on your right – and continue straight on Via Leonardo Da Vinci in the direction of Volterra / San Gimignano (leaving Via delle Colline that continues to the left). 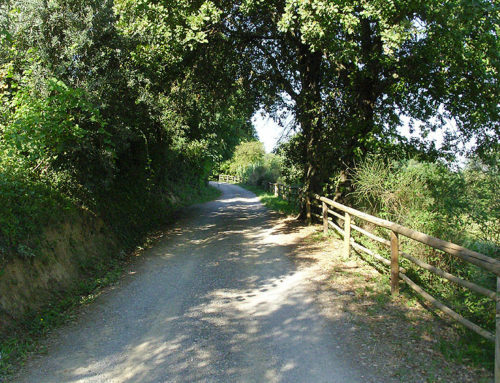 Here, the ascent to Poggio all’Aglione begins. 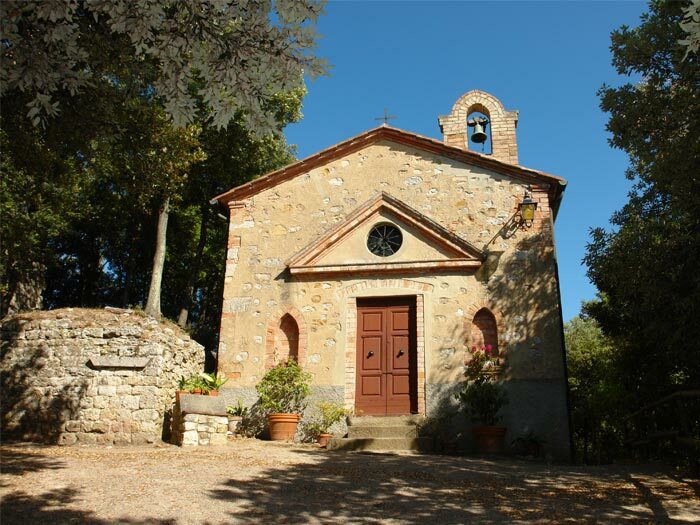 At one point on the right you can admire a wonderful specimen of old oak trees, while a little later after the junction – which you see on the right – of Via Pozzolo to San Vivaldo pass in front of a Roman Cistern of the second century. A.D. formerly used to store rainwater. 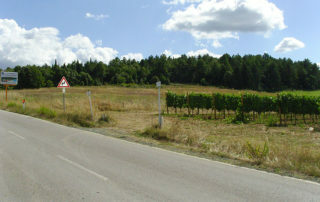 Continue up the paved road skirting a vineyard on your right and after about 200 meters – at the end of the vineyard – turn right go past a chain and enter the gravel path. 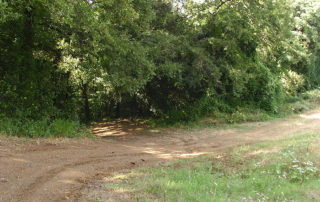 The first stretch of the gravel road is slightly uphill and runs parallel to the paved road that will be on your right. Continue on the path closer to the woods. Then the road starts to turn slightly to the right and becomes flat. While skirting the forest for about 300 meters leaving it to the left, on the right you can admire a breathtaking landscape that sweeps across Valdelsa. As soon as the road begins to go down, turn left into the woods. To shorten you could also go straight on, but it is better to turn left not to miss a very charming and funny technical stretch of single track. 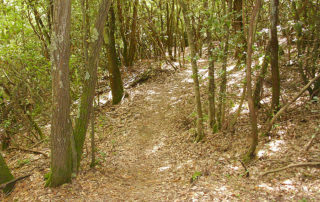 In this path you must be careful, because in the woods it is easy to find deviations or other paths that often lead nowhere and that are usually used by hunters. So you had better follow carefully the description of the track with the help of the white / red signs that you see painted on trees or be accompanied by a guide who knows the way. 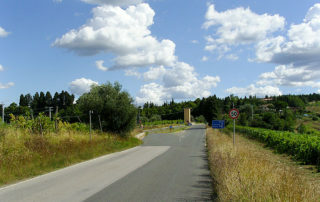 The first stretch is downhill and quite wide, with the vegetation that creates a tunnel. 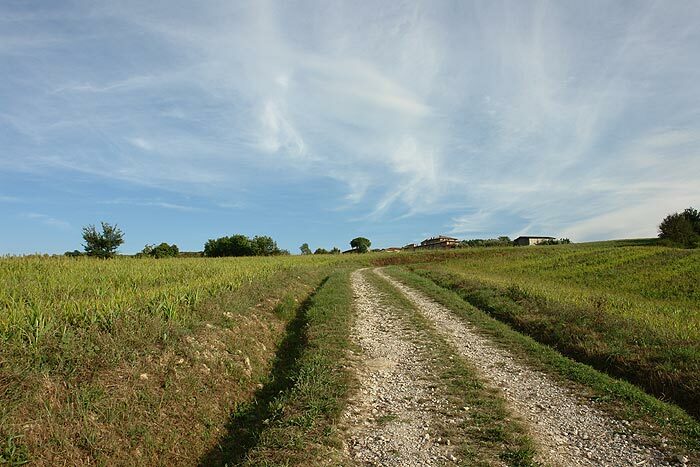 After a few hundred meters, your track is crossed by a path that you will meet later continuing on the main path. Continue straight on. The road begins to narrow, then turn tight on the right. Here begins a quite steep and technical descent among the trees and with a ground made of foliage. You have to be careful and do not slip, in fact, on the left there is a quite deep ditch, it almost looks like a bed of a dry creek. To have some orientation is recommended to pay attention to the red and white signs that are on some trees and show that you are on the right track. After about 150 meters pass under a pine tree completely bent diagonally and then, cross the path described earlier. In practice, our path follows the route of an “S”, intersected by the path described above. After this junction the road widens and begins a gentle ascent for about 450 meters until you get out of the woods. 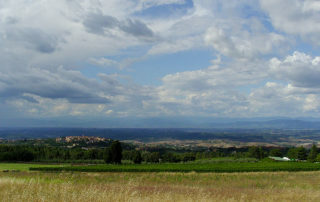 From this point you can if you turn your gaze to the right, see at 150 meters above you, the point where you entered the woods in front of you and in the distance the Roman Cistern. 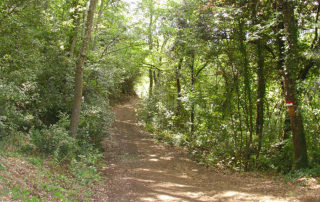 Continue downhill to the left for about 100 meters and then turn left into the woods again. 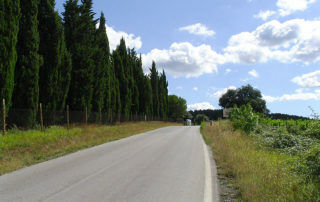 The first downhill section is wide enough on a ground that in winter or after a day of rain has some puddles that cross the entire road. After about 580 meters you come to a junction (in front of you, you can see a tree with the characteristic white and red signs), here turn right on a sharp bend, take the path downhill. After 400 meters you come to a junction where, near a path that goes down to the left, you will come across a fence. At this point you have to follow the fence leaving it, for the moment, on the left. Start a short descent and then go up slightly until you come to a junction where there are 4 roads. Take the one to the left, downhill, along the fence. 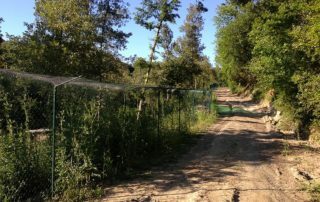 After about 80 meters you come to a widening and turn left following the path along the fence until you arrive – after 300 meters – to a small lake that you will see on your left beyond the fence. 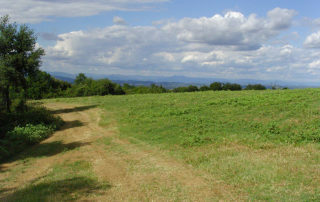 After 20 meters, leave the trail that runs along the fence to turn right, following the path downhill. Here you have to be careful, because the descent is quite steep and the ground could be uneven due to erosion of the rains. At the end of this short descent of about 50 meters, you can expect an ascent equally short (about 100 meters), but very steep, to the point that, most likely, you will have to get off and push your bike. After a short flat stretch you will get to a junction where you find painted on trees the white and red signs. Then turn right and follow the road downhill. You should always follow the main path with the help of the red and white signs painted on trees because it is easy to find paths on the right that can make you lose your way. However, if you accidentally take one of these paths on the right, do not worry, because all will take you to the valley where the river Egola flows and you will have only shortened the route. 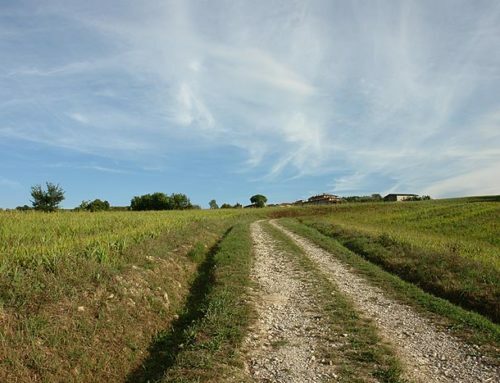 At one point the path – slightly downhill – narrows into a single track, on a ground that on Winter or after a rainy day will make you soil your loved bicycles. At the first junction turn right and follow the signs on the trees, then after 20 meters continue curving right again. 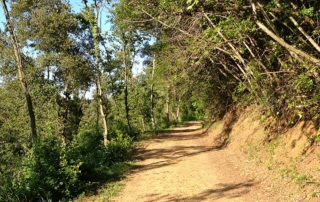 Here you have to follow the main path that runs along the side of the hill and be very careful because the trail – as well as being very narrow – shows on your left a cliff down to the river Egola. After about 300 meters you will come to a junction where you have to take the road to the left on a stony ground and much wider than the previous section. 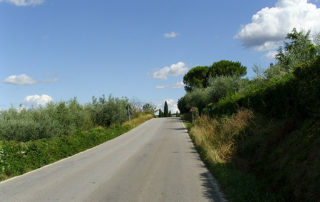 Continuing on the main road, the ground becomes gravelly and among gently ups and downs you will reach after a few hundred meters, the river Egola. 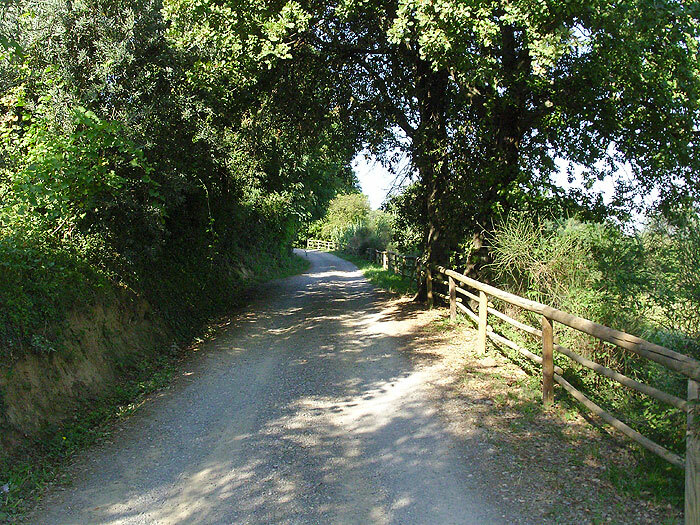 After fording the river Egola twice (during Summer the water level does not exceed 20 cm but in Fall and Winter crossing the stream might be more challenging), take the path that goes to the right until, after about 100 meters, you will arrive on the paved road Via dei tre Ponti and turn right. The road goes up slightly, after 600 meters you will find on your right the road that takes you back to the Roman Cistern, instead you have to go straight on. 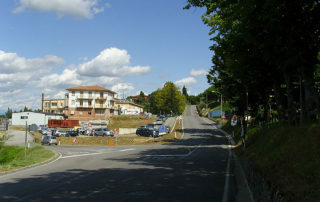 At this point a slight discent for about 2 km starts, until you reach Tre Ponti (the road curving to the left passes over three bridges), then a slight ascent for about 800 meters until you get to the junction in Montaione between Viale Filicaja and Via Leonardo Da Vinci. Turn left, you will get onto Via G. Di Vittorio and after a short ascent you will arrive back at the starting point in Piazza Gramsci. 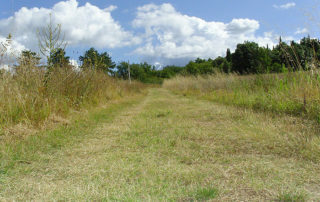 The bike tracks that you find on this website are maintained thanks to the help of volunteers. 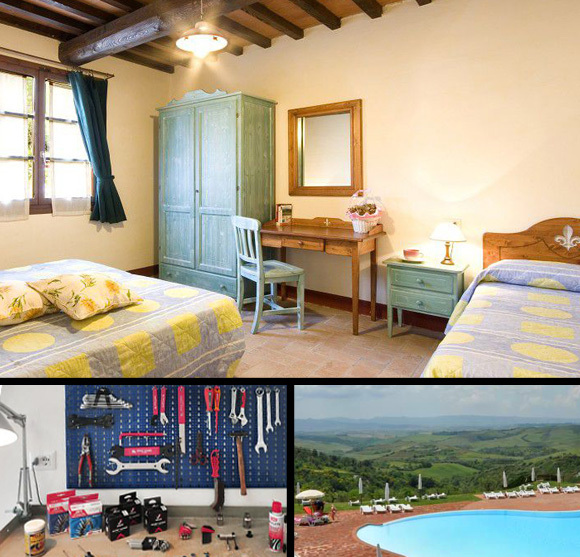 Rent a Scott bike with 10% discount by booking any tour. 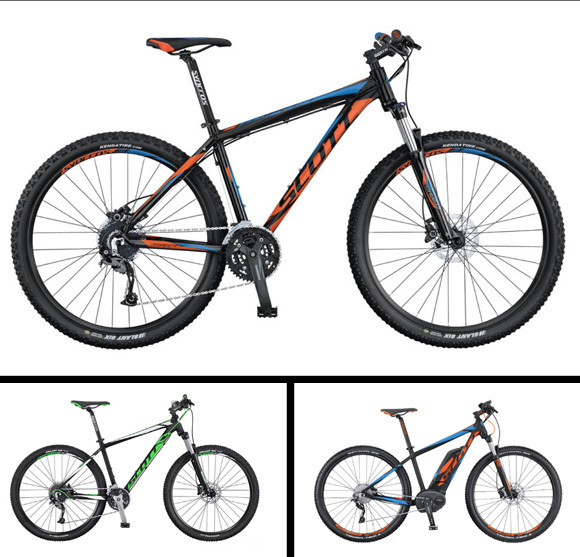 Try the pedal assist technology of new Scott e-bike Aspect 920. To recuperate and be ready for a new riding day or to have a space where you can leave your bikes safe or make minor repairs.